It also reminded us of another issue we’ve had about Hevesi’s whole hevesi-ing episode. Namely, that he claimed he’d used the state employee to chauffeur his wife both due to security concerns and also because his wife is — as all the papers say — “ailing.” Why is the comptroller so concerned for his wife’s safety? And, more intriguingly, what ails Carol Hevesi? The ailments aren’t new. As an assemblyman from 1971 to 1993, Hevesi missed some thousand-odd floor votes; when his opponent for the city comptroller’s post in 1993 confronted him on that poor attendance, Hevesi dismissed the importance of the votes and, for the first time, said that his wife suffered from a debilitating illness which sometimes distracted him from his job. He lately seems to have been able to focus all right, but Ethics Commission did determine in 2003 that the nature of Hevesi’s current position warranted “appreciable concern” for his wife’s safety. 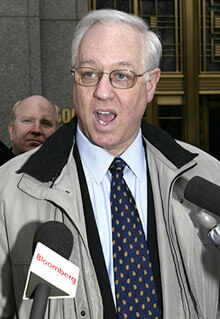 In fact, Hevesi has received a number of death threats for going after mob-related businesses, among other things. He was once mailed a dead parakeet, which implies imminent doom to anyone who “sings” to the authorities, according to Mafia expert Rick Porrello. The bullet the postman recently brought Hevesi requires less interpretation. That said, Mrs. Hevesi’s driver was never armed. So what security purpose did he serve? Hevesi’s spokesman has suggested the driver’s size and general manliness made Mrs. H. feel safe.